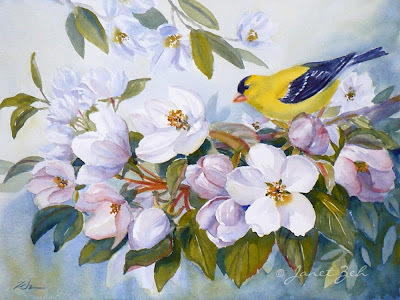 A bright yellow goldfinch alights upon a tree branch laden with crabapple flowers. Goldfinch and Crabapple Blossoms can be ordered in several sizes framed, unframed or on canvas. Click the Order Print button below for sizes, options and prices.